My 14-year-old did this on her own so I can’t really take any credit, but I thought it would be a wonderful idea for geography study. What she did is draw our state (Massachusetts). She did this by hand just looking at a picture. Though we have never done this in school, this part is actually just what Charlotte Mason would do — have kids learn to draw maps freehand. Then she looked up facts about the state and added things in zentangle fashion. If you look around, you should be able to see in this our state flower and state bird, a sport invented in MA, the state flag and more. You can also then use this page as a coloring page. If you’d like to color her image or print it out for inspiration, I just ask that you do to her blog, http://www.creationsbymaris.wordpress.com, to do so. Look for the “free adult coloring pages” link. For our second endeavor, I picked a news story that seemed liked it would be relatively easy to understand and have a natural connection with geography: the plight of refugees in Slovenia. ** These refugees have come from the Middle East and are hoping to get to Germany and have been pushed off into Slovenia by neighboring Hungary. We read the story, looked at our atlas, and then talked about where the refugees came from, what their easiest means of travel would be (sea travel across the Mediterranean), why they would choose the Slovenia area, and the like. I think it was a somewhat fruitful conversation. I would like to gain the ability to delve deeper and deeper into such stories and to get more out of our studies but it felt like not a bad beginning. My goal is to do such studies once or twice a month. I will try to post here about how they are going. **Side note (well, footnote, really, I suppose): My source for this news blurb and a magazine I really love is The Week. If you are not familiar with it, is is a news summary magazine. Issued weekly, it purports to be “all you need to know about everything that matters.” If you are like me and can’t always keep up with everything in detail, it is a great way to make sure you are not completely out of the loop, current events-wise. Plus I think it will prvide great fodder for these sorts of studies. For the upcoming Charlotte Mason Blog Carnival I am reading the section of Charlotte’s sixth book which deals with geography. My own initial thought when became a homeschooler and heard others talking about geography was that it seemed like a very old-fashioned subject. I think I also had very dry conceptions of what geography should be, imagining memorizing countries in Africa with little or no context. As I am beginning to study geography in a CM way, I am seeing that what Charlotte describes is exactly what has happened. We have lost all sense of beauty in the world. We no longer study science or geography for the sake of learning about what God has made. After we first lose this conception, we then begin to strip geography down until it becomes what I had always imagined — a dry subject focused mainly on memorization. For map drills we use free online games from Sheppard Software. With a little introduction, my kids have all been able to do this on their own. They all do it once a week for about 5 minutes so this does not add a big burden to our day. 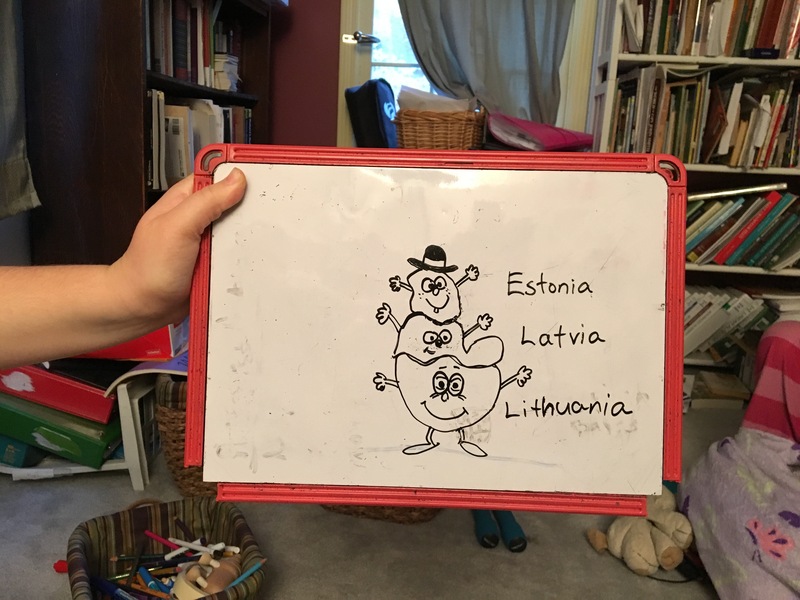 For many areas of the world, we had gone over the countries ahead of time, coming up with mnemonics to help us remember the order they come in. For instance, for central America we say “big gorillas eat hotdogs, not cold pizza” (for Belize, Guatemala, El Salvador, Honduras, Nicaragua, Costa Rica, Panama). We did not, however, do this for Africa and they still all seem to have learned the countries on their own by playing the games. While we are always looking for more, there are a number of geography books we have enjoyed. One of the first was V.M. Hillyer’s Child’s Geography. I like a lot of Hillyer’s books. They are older and so sometimes things have changed (or changed and changed again; how many Germanys are there?). But I find such things just give me the chance to talk about world events and how things change. He also uses outdated languages referring to people groups which I either edit as I go or else use again as a chance to discuss how things have changed. Last year we finished a book I had found at a used book store called In the Land of the Lion. It is probably hard to come by but it was again an older work, this one focused entirely on Africa and particularly on its animals. Animals can be a great way to get into geography because kids are interested in them and they also naturally lead one to consider climate and landscape. We followed this up with a book on Australian animals called Spotty the Bower Bird. This year we are beginning a large volume by Richard Halliburton called the Book of Marvels. It begins in the US and continues through the world discussing both man-made and natural features. For example, thus far we have read about the bridges in San Francisco, Yosemite and the Grand Canyon. The chapters are short and a great length for reading aloud together. There are lots of pictures though they are in black and white. I am having the children place each spot on a map of the US as we go so they get a sense of where things are. It is again an older book, as all the good ones seem to be, so I do wonder if some of the things its says along the lines of “this is the biggest bridge” are still true. How about you, what geography sources have you found and loved?